BABES&TOTS: Sign in happens in the babes&tots room at any point during the morning. We need another volunteer for this Sunday as they only have space for 6 children at this point. Let me know if you can jump in and help. Thanks! It’s easy to get bent out of shape because other people are talking about Jesus differently than we are but he has something important to say about that. When have you felt jealous? How does our family show love? Help us God, to see your love and the good things you do in everyone that you love. Amen. Make ‘Jesus loves you’ hearts to share with all your family and friends. 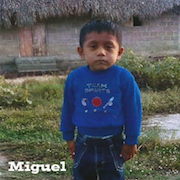 Miguel, he lives in Mexico with his dad, mom and three siblings. We show God’s love to him by supporting him with money through Compassion. Pray for Miguel this week.